Hello and welcome to our website, in this section we are going to tell you a little about ourselves, the company and the story behind our success. Spitting Pig London began over 10 years ago providing some of the finest and freshest London hog roast catering. 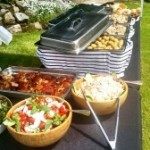 With a real passion for providing top quality event catering at reasonable prices our reputation soon grew and with it the desire for a hog roast caterer in London for parties and business meetings. We very quickly established a base from which was hog roasts in London and the rest as they say is history. We began as most businesses do small but ambitious we worked hard and gave each event our personal attention. Part of our success was down to our versatility as a company there was and still is no task too big or too small that we won’t take on and we love beginning able to provide our customers with a catering experience that it unique to their event. Year on year we reinvested in the company making sure we ensuring we provide the highest quality of service using the best equipment available this had become a core philosophy of the business. This is reiterated by the fact that we manufacture our own equipment, this has been an area of the business we have worked relentlessly on to ensure that every weekend we can provide the finest and most succulent meat. Over the past 10 years spit roasting pigs in London has grown significantly and now operates as its own entity as the capitals leading provider of hog roast for all types and scales of events. We are working all year round all over the Greater London area and are staff are always available to contact so you can be assured that when you book with Spitting Pig we are only a phone call away and that your event catering is in safe and professional hands. One issue that we haven’t loss sight of over the past 10 years is that we still value the customers that made us what we are today and we at Hog Roast London takes pride in the fact that no matter the size or type of event we use our extensive knowledge, meticulous planning and attention to detail to ensure that every event we work on has a special atmosphere and spectacular results. 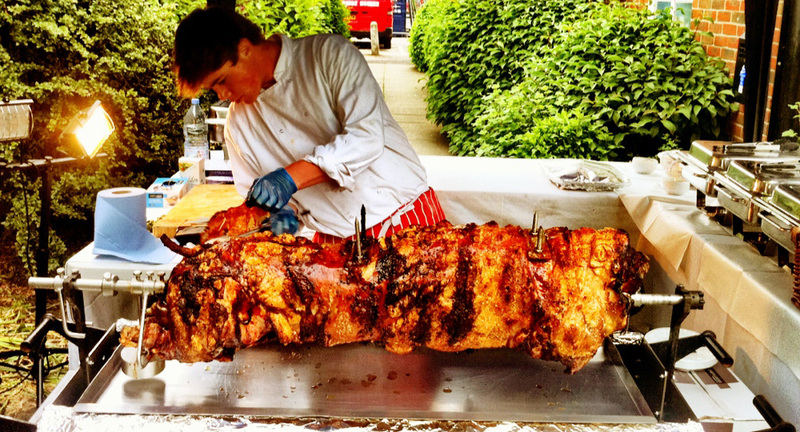 Today Hog Roast London has 5 fully qualified catering teams working all over the nation’s capital every weekend providing succulents meats for high class elegant weddings, stunning corporate events or just small and personal get togethers in the family garden. So why don’t you take a look at our menus and become part of our story by using Hog Roast London at your next event. 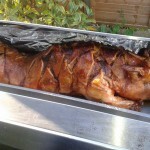 We are one of the leading hog roast caterers in the entire country. Offering a variety of different menus and services across many locations throughout the nation’s capital we are the number one choice for your event. 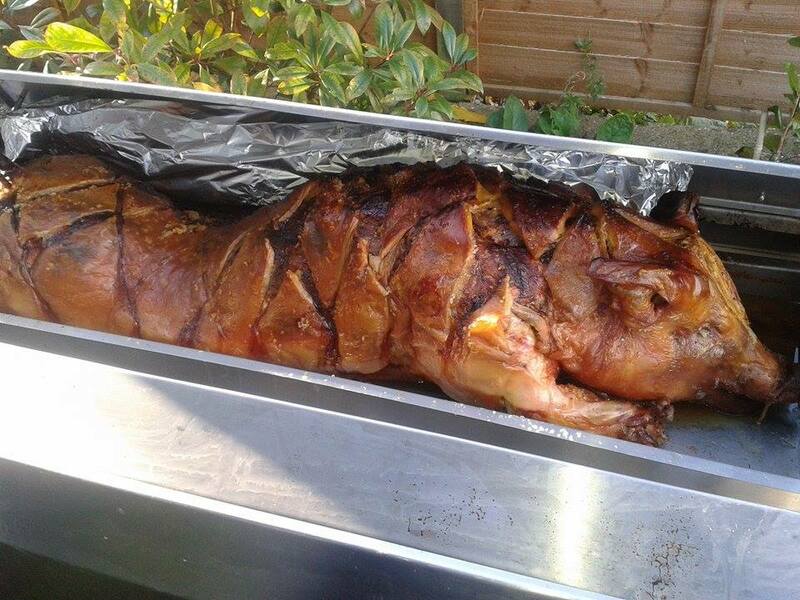 So whether you are having a hog roast Dagenham for a garden party, a wedding hog roast in Wimbledon or you just need a hog roast in Chelsea to provide some food for you and your mates after the Chelsea FC match then gives us a call and we will meet all your catering needs. One of the most popular things to do, especially in summer, is to organise a garden party. And a hog roast in Dagenham is no stranger to these. So whether you are hosting a group of friends or family or looking to impress potential clients at your party there’s no better alternative than Hog Roast London. We make sure that once you have picked us to provide the catering for your party then you will get 100% of our time and effort. One of our fully qualified catering teams is there for you from day one of planning to the end of the party cleaning up; we have everything covered so you don’t have to worry about a thing. We make sure that we go through each menu with you so that you are sure that you have made the right choice for you and your guests. We make sure that we know how many guest we need to cater for so that no one goes hungry. Every last detail is planned to perfection ensuring that your party runs smoothly. The most important thing for us is the quality of the food we provide. Our hog roasts are a taste sensation. It doesn’t matter whether you choose a traditional spit roasted pig or a barbecued chicken all of our food is of the highest quality. The way or meats are cooked provide you with melt in the mouth succulent food for all your guests to enjoy. And it’s not just our meat that is tasty. We also provide any side orders that you want, whether it be seasonal vegetables or fresh salad, we make sure they taste just as good as the meat you have chosen. All of our chefs arrive at your event 5 to 6 hours before it starts to freshly prepare your hog roast and other side dishes. We like to make sure that you are aware of the freshness of our food by preparing it at the party rather than just bringing it in last minute and pulling it all out of a packet. 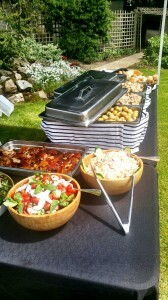 The hog roast is also cooked and served live in front of front of your guests when it is ready to eat. This is an experience that you will never forget. Some areas around London we offer our Hog Roast and Hog Roast Caterer services too – Barking, Batersea, Brixton, Clapham, Barnet, Bexley, Brent, Bromley, Camden, Cranford, Denham, Docklands, Ealing, Greenwich, Hackney, Hammersmith, Fulham, Hampton Court, Haringey, Harrow, Havering, Hayes, Heathrow, Hillingdon, Hounslow, Islington, Kensington, Chelsea, Kingston, Lambeth, Lewisham, London, Newham, Redbridge, Richmond, Ruislip, Southwark, Staines, Sunbury, Sutton, Twickenham, Uxbridge, Waltham Forest, Wandsworth, Wembley, West Drayton, Westminster, Wimbledon. A popular use of hog roast catering is for small house parties for you and your friends. It is easy to see why hog roast catering is becoming more popular because we aren’t just limited to big banquets; we can cater for every party no matter how big or small. One of the most popular pastimes in Chelsea is going to watch the mighty Blues play at Stamford Bridge. More often than not Chelsea FC provide excellent entertainment and a positive result so what better way to end the day than having a hog roast party for you and all your football buddies. Rather than going to the local kebab house or nearest burger stand after the game why not hire use to provide you with delicious hog roast sandwiches. This is one of most popular menus and is suitable for all occasions. We offer succulent spit roasted pig served on a fresh bap with crispy crackling and apple sauce. This is the perfect post game food for everyone. And it is also much healthier than the normal food served in and around the ground. The best thing about hiring us for your party is that we do everything for you.